A comment on my post Should we change the way classical audiences listen? by MarkAMeldon extolling the virtues of pre-stereo recordings of Bruno Walter, Wilhelm Furtwängler, Hans Knappertsbusch and Rafael Kubelik ends with the cryptic question of back to mono anyone? Which prompted me to listen again to the Griller Quartet's mono recording of Ernest Bloch's four string quartets which I first praised On An Overgrown Path eleven years ago. 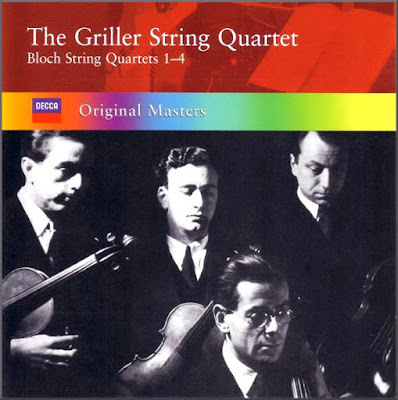 Pau Casals declared that "The best composer of our times is Ernest Bloch" and the Griller's interpretations provide strong support for that controversial claim. Seen above is one of the original LP releases, and below is the now deleted 2004 CD transfer. These 1954 Decca recordings were produced by the late Peter Andry who later became general manager of EMI's International Classical Division, where he was my boss in the late 1970s. Forget about the old technology used to make these recordings, because on a monitor quality audio system they equal or surpass both in sound and performance anything produced in the digital age. And there are good simple common sense reasons why. It is is a clear sign of inverted priorities that today's classical music practitioners are better versed in understanding the relationship between websites, box office, and customer relationship management software than in understanding elementary physics - aka old technology. Sound and therefore music is vibrating energy. A musical instrument does no more than produce complex vibrations; the faster the vibration the higher the pitch, and the larger the amplitude of the vibration the louder the music. One of the most basic laws of physics is the Law of the Conservation of Energy, which states that energy - which includes the vibrations that are music - cannot be created or destroyed; it can only be changed from one form to another. Great music stirs the soul when the energy produced by the performers is transferred directly to the listener. All recording technologies from wax cylinders to digital files change the vibrating energy of live music into a storable form - vinyl LP or digital file - and then back again into analogue sound that is reproduced through speakers or headphones. The shorter and simpler the path from music source to replay transducer (speakers/headphones), the more efficiently and effectively the energy is transferred. Which is why live music always stirs the soul more powerfully than recorded music. But virtually every new technology fervently embraced by classical music lengthens and complicates the energy path, which in technical terminology means it becomes more lossy. That is why, given the right replay conditions, a vinyl LP sounds better than a CD; because the energy in the analogue wave form of the record groove has undergone less corrupting transformation than the heavily manipulated digital file. And that is why simple stereo recordings sound better than the lossy manipulation involved in multiple microphone recordings. But let's avoid this thread degenerating into an unproductive analogue versus digital argument, because digital technologies are here to stay. However new technology must supplement and not supplant old technology, and the common sense rule that the more lossy the energy path, the more the power of the music diminishes applies way beyond the recording studio. Virtually every one of the silver bullets proposed for rejuvenating classical music - snackable content, egregious radio presenters, dumbed down websites etc etc - have the opposite effect to that intended, simply because they put obstacles in the energy path between musician and listener. If classical music really wants to engage new audiences it needs to spend a lot less time understanding customer relationship management software and a lot more time understanding energy paths. The Tenebrae concert I was at in the Queen's Hall this week was broadcast live by BBC Radio3 using only two microphones placed mid-hall suspended by a line between the balconies. I haven't listened to it on iPlayer yet, but I will be interested to compare the broadcast sound with what I heard from a seat in the balcony directly behind the microphones. Nicely put. What's important is not merely the composition, nor merely the performance, but the faithful transmittal of both into the listener's ear and mind. Get that right and the music promotes itself. It really is a quite astonishing sign of the times that I managed to purchase the Decca Mono box for a whisker under £50 delivered. 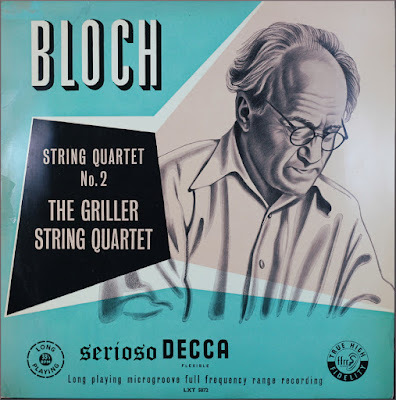 Generally the transfers are excellent and the box contains many treasures, including the Bloch/Griller disc mentioned above. I'm tempted by the DG Mono box, too. Oddly, the mix of ancient broadcast recordings allied to modern digital technology can be very beneficial. One of my prized possessions is a SACD release from Tahra with Furtwangler conducting the Wiener Philharmoniker In Bethoven 9 on 3 Feb 1952 (TAHRA SACD Furt 2012 released in 2012 - www.tahra.com). Single-channel and SACD can work!